Although facial veins do not present a medical concern, they can be seen as cosmetically unattractive by those who have them. 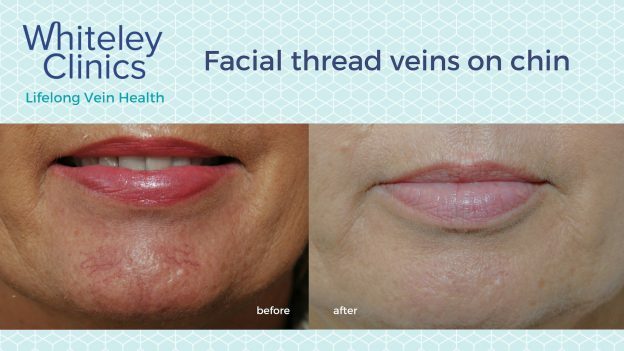 Because facial veins are considered cosmetic, it is not possible to have them removed via the National Health Service. 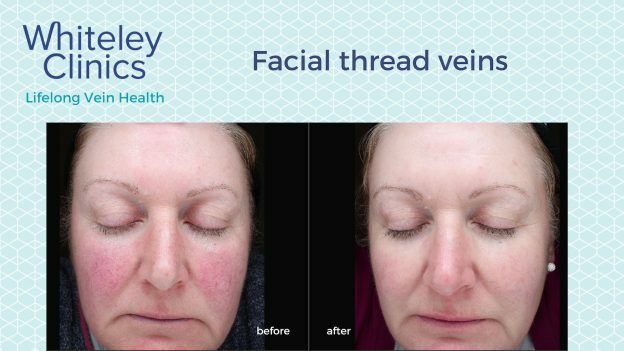 Victoria Smith at The Whiteley Clinic has the skills and techniques to remove the small, red and thread like veins that often develop around the nose and check area and can also safely remove the more complex bluey green veins on the forehead and temple area. There are several procedures that can be used to treat facial red veins and the best one is selected based on the intensity, size, colour and location of the vein(s). Intense Pulsed Light (IPL) works very well in treating any diffused redness and is also beneficial if you suffer with Rosacea. For the more defined red veins that develop on the cheeks and chin area, Electro Surgery uses a current to heat and cauterise the vessel. The blood then clots, before it is broken down and reabsorbed by the body, leaving the skin to heal and the dead skin cells to flake away. For larger, darker veins and those that are bluey green coloured (that do not bulge) an Nd:Yag laser can be used to heat and destroy the vessel. Most veins on the forehead and temple can be treated with Laser, IPL or Electro Surgery. All of these are performed by Victoria who leads the aesthetic phlebology vein treatments The Whiteley Clinic. When the veins bulge, they can often be too big for effective treatment with the non-surgical options. In these cases, surgical removal is the better option to achieve a good result. The procedure is known as ‘phlebectomy’ which literally means removal of the vein. Removal of veins on the temple, forehead and face is a challenging area of venous surgery. The local anaesthetic technique for doing this has been developed and is undertaken by Professor Whiteley. Patients who are assessed at The Whiteley Clinic benefit by receiving the best clinical advice. More complex cases can be jointly assessed with Victoria Smith and Professor Whiteley thus ensuring a treatment plan that provides optimal results. Some clinics may use sclerotherapy to inject and destroy facial and temple veins. At The Whiteley Clinic, we regard this as a risk practice. Veins on the cheek, temple and forehead can drain into the veins in the eye socket (orbit). There is a risk the sclerotherapy can go back through the veins of the orbit and into a major vein in the brain. Hence sclerotherapy should only be used on the face in exceptional circumstances, if at all. Prominent and embarrassing veins on the breasts can also be effectively removed using the phlebectomy procedure. Blue / green breast veins appear for a number of reasons, usually where the skin on the breast has been forced to stretch and thin out, which is why the blue veins show through. This is often seen after breast augmentation surgery or as a result of the natural enlargement of the breast experienced during pregnancy. Large, bulging veins of the arms are completely normal and can be removed using the phlebectomy procedure performed by Professor Whiteley. It is unusual for there to be a medical reason to have arm veins removed and they are generally removed for cosmetic purposes. The cost for these treatments vary but non-surgical methods start from £150 and surgical methods from £1,900. The best method(s) of treatment and a personalised treatment plan will be discussed at your consultation. It is during your consultation that you will be advised on recovery times and pre and post care advice that you will need to take into consideration when planning for your treatment. For more information about the above treatments or to book in your consultation, please call 0330 581 850 or email info@thewhiteleyclinic.co.uk. We look forward to welcoming you at our clinic.